I have been paying just over $24 each month for three years for an accident policy for The Orange Dog. If I had put this money into a regular savings account I would still have over $1000 that I've paid in premiums and I wouldn’t have to spend my time screaming at my insurer's call centre people and threatening law suits. I would have benefited from the compounding interest on my money and I would have had the ready cash to pay his vet bill after his accident. I have been fighting with Pet Sure (under the comforting guise of RSPCA Pet Insurance) and I’ve come to the conclusion that PetSure is benefitting from and tarnishing the good name of The RSPCA. Then I discovered their other ‘brands’ all credible reputable trusted company names. So what happened? We had a playdate, the kids were playing totem tennis, Orange Dog was with me and the other mum, having a cuddle on the deck, then he jumped up and ran to the kids catching a racket backswing in the face. It was awful, Buddy shrieked, and staggered backwards, he couldn’t open his eye the little girl, who couldn’t possibly have seen him behind her, was sobbing her heart out… it was an awful accident. Pet Sure refused my claim saying this was not classed as an accident but an illness. So I called them and informed them that being struck in the face was neither viral nor bacterial. They said they’d look into it and I heard nothing for months. On my second call I was told that the Vet nurse hadn’t sent through the case notes, that is why the claim was rejected. To cut a long story short this went back and forth until this year the vet took over and spoke with the Pet Sure people, asked what they wanted exactly and sent exactly that. Then nothing for another seven weeks. So today I called to ask why they hadn’t paid my claim or provided any feedback. In Buddy’s case it was a combination of 2 and 3 to the lens of his eye and his cheeks, which did take a while to recover. If you ask me, facial abrasions are hard to locate underneath thick fur. Since this farce began I started putting money into an interest bearing savings account which has generated more interest than the payout I should have received from RSPCA Insurance. My conclusion is that anyone considering insuring their pet, on the off-chance they have the right kind of accident, resulting in the very specific injuries allowable, and they have located and read all the fine print, followed the trail of additional clauses, and they can persevere for years to get the claim paid.. is crazy. Far better to create your own insurance policy in a bank earning interest where there is no fine print, no excuses, no cheating and you keep the money you don’t spend directly at your vet. 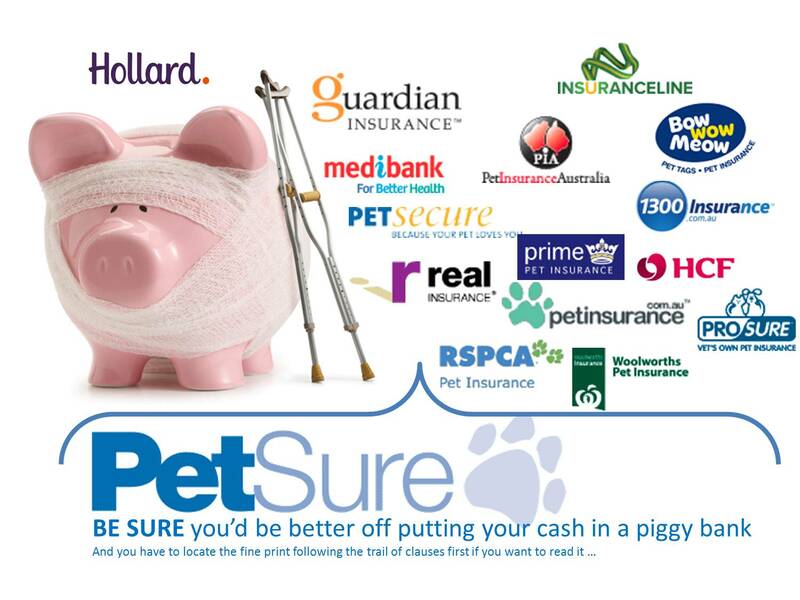 Furthermore when I looked up PetSure I was staggered to see most of the other pet insurers are their own ‘brands’ and all underwritten by Holland Insurance. So I can’t say I have any confidence in any of them being fair and honest. Isn’t life is hard enough without cheaters? After launching my social media campaign which involved, emails, blogs, Pinterest posts and tweets to everyone including the CEO of underwriters Holland Insurance. PetSure have revoked their refusal and scheduled the claim payment of $124.00 - "as a good-will gesture- Not an admission of any wrong doing'. I cancelled my policy immediately; I told them neither their service nor their product are worth $24 a month. They really wanted to keep that $124. Well from now on I'll keep my premiums.